On the line: Manulla's Lucas De Paula looks to keep the ball in play against Westport last weekend. Photo: Manulla FC. After last weekend's break for league cup action the attention returns to league football this weekend for the top division sides. On Saturday night, third placed Ballina Town will host seventh place Ballyglass in Belleek at 6.30pm. Last weekend both sides picked up wins in the Westaro Cup with the north Mayo men securing a 2-0 win over Ballyheane at home. Mick Duffy made a number of changes to his normal starting line up, but they still had enough against the Quigley Park men with Jamie Cawley and an own-goal seeing them home. Ballyglass were involved in a thriller seeing off Claremorris 4-3 thanks to an extra time JP O'Gorman winner. Ballyglass had led 2-0 early in the second half after a goalless opening 45 minutes, thanks to goals from O'Gorman and Conor Maloney - before Claremorris pegged them back and through goals from Danny Broderick and Ronan Commons to level it up at 2-2. The Concannon Park outfit went a goal to the good on 67 minutes when Finian Brady found the back of the net — but five minutes from time Conor Heneghan squared it up at 3-3 and the visitors were to strike the decisive goal in extra time. The other game on Saturday night sees Manulla host Kiltimagh-Knock United in Carramore. The hosts will head into this one with a pep in their step after they took the scalp of defending league champions Westport United in the league cup last weekend. Westport were short a number of first team regulars last weekend but they managed to force the game to extra time, thanks to Darren Browne's injury time strike - cancelling out Gerry Canavan's earlier strike. Canavan was to have the decisive moment in the game scoring his side's second in extra time to send Manulla through to the next round. 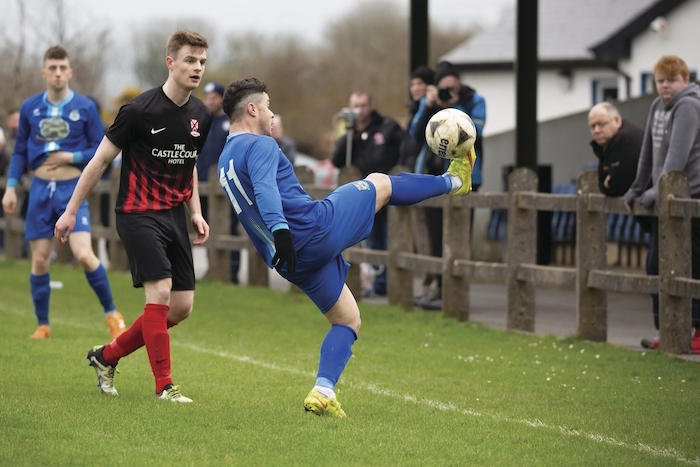 On Sunday, Westport United will host Ballyheane as they look keep up their 100 per cent league record, both sides head into this one on the back of a defeats in the cup, but the hosts will be expected to take all three points on Sunday. Castlebar Celtic will be looking to pick up their second league win of the season when they host Iorras Aontaithe in Celtic Park on Sunday. The hosts hit Kiltimagh-Knock United for six in the second half last weekend in their league cup game, with Liam Flatley hitting four and Gary Concannon and Jose Navarro bagging one each. The north Mayo men head south on the back of coming out on the wrong side of a five goal thriller against Straide and Foxford United last weekend. Brendan Nallen and Ivan Barrett got the Iorras goals as they fell to a 3-2 defeat to the same opponents for the second time in three weeks. Iorras are one of three sides yet to pick up a point in the league this season and they will need to get some points on the board soon. The final game of the weekend sees the meeting of another of the pointless sides in the top flight, Claremorris who will host high flying Straide and Foxford United. Claremorris held Castlebar Celtic until half-time last weekend, before the Hoops put half-a-dozen past them in the second half. Meanwhile Straide and Foxford United kept up their great start to the season seeing off Iorras 3-2, with Simon Helly, Ashley Atkinson, and Stephen Moyles all finding the net. Saturday, April 21: Ballina Town v Ballyglass at 6.30pm, Manulla v Kiltimagh-Knock United at 6.30pm. Sunday, April 22: Castlebar Celtic v Iorras Aontaithe at 11am, Claremorris v Straide and Foxford United at 11am, Westport United v Ballyheane at 11am.